Tag Archives: Education Office Walsall Town Hall. 21st- 31st May: Battalion Training. In Rest Billets. Pte BERTIE HIBBETT: LETTER to MARIE NEAL & ARTHUR HIBBETT, 95 Foden Rd Walsall. ‘For the Lord be high, yet he hath respect unto the lowly; as for the proud he beholdeth them afar off’. Psalm 138. ‘I am not alone, because the Father is with me’. ‘I will pray the Father for you, for the Father himself loveth you’. (3) Gospel for:- 5th Sunday after Easter. May 28/ 16. I guessed it was Empire Day (4) on Wednesday when I sent you my ‘Doggerel Illustrated’ – one copy, whichever you choose, was for Miss Foster. After a long day’s work in a big wood, making hurdles for trenches, I came back rather tired with the expectation of the parcel you told me to look out for. Lo! what a pleasure indeed to find it when I returned, just in time for a comfy luxurious Sunday tea; I washed my sweaty hands, wood stained through chopping, & then took the parcel into a neighbouring field & there I did enjoy the things – and so fulfilled your wish. You remembered it seemed, that I love those ginger cakes with icing on top. 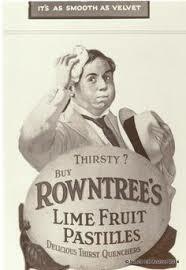 Are they any dearer now? Bates* used to have them for lunch & send me to Pathesons (5) for them. Many thanks for the favourite chocolates & the very acceptable and ‘suitable’ lime juice pastilles; both Dodger & you still remember what I like in confectionery. So also the DUCKY eggs which I am keeping to enjoy for tomorrow’s breakfast. After a thirsty day the Pineapple chunks were delicious. Thank you for the notepaper. Could you send some envelopes with the next lot? Now, dear Mum, the thought of those sketches in Fragments of France (6) more particularly the wording underneath, did enter my mind as vulgar. 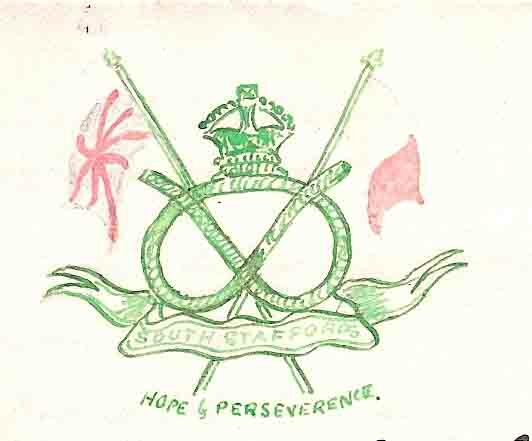 Lieut Sanger* told me he (Bairnsfather) had been libelled for one of his sketches. 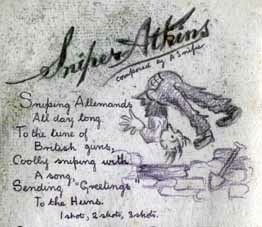 Sniper Atkins: A.H.Hibbett. May 1916. I do hope you will not think my pictures, illustrating that poem of mine, are vulgar also, but mine are chiefly originals. You will recognise one or two of them as copies from Fragments of France. One of the Snipers had it sent to him. The features in my pictures are similar to Bairnsfather’s. What do you think of the verses? I wrote to Miss Bore* last night & sent her a copy. I had two lovely letters from Miss K.E. Brookes* from Malvern & today the parcel of cigarettes, (which were from Samudas (7) & first intended for me & which Miss Brookes said had been returned to her, for what reason she did not say) came with your parcels & were readdressed to Sydney and I had his lot. Miss Brookes sent me a PC of Malvern also; they are doing their bit well I think. Yes I ‘compris’ your meaning of the amusing display of swank and ‘offishness’. Do you read the texts at the top of my letters? – see what I have written about the ‘Proud’ in today’s Psalms. Empire Day generally turns out sunny. We had it sunny too. You were all alone you said, – see that part of the Gospel. I particularly thought of you when I read it & the text has been mine before the war & since. I was very, very pleased indeed to hear that Sydney got his birthday parcels on the very day. I have written twice since he left me. Once on his birthday & one previous, which I hoped he would get on the day. Do you know Mum, between we selves, I think the reason Sydney has gone in for the Course of Armoury (8) (and in hopes to be an Armoury Sergeant) is to get out of the way of these new draft officers. But excepting Lieut Sanger* of course, who wished he had Sydney as his Platoon Sergeant. Sanger is over us now – 2 Platoon. I remembered you to him & he often asks me concerning you both. I had a nice long letter from Auntie (Pattie) about Military Sunday (9). She said she could not help, with others, feeling sad at the sight of so many soldiers – not so much of those particular soldiers, but it reminded her of the War. 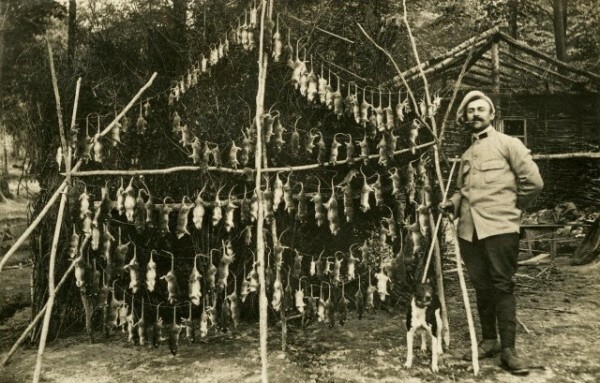 French Rats, Rat Catcher & dog. WW1. There are not so many rats in this barn, why I can’t say. I have not seen one yet. The sketch I drew of ‘A night attack repulsed’ is typical of a usual night’s rest in the last barns previous to these. Oh Auntie doesn’t know yet that Ida is away doing farm work & she said how pleased matters turned out for Basil, he could go out with Ida. So is Basil full up with Wednesday afternoons now like Sydney & I were? Does he go firing at Tame Valley Range? (10). You can write long letters Mummy but do they interfere with your ‘business’? Yes I told you in my last that the (cooker) refill arrived safely. Apparently you did not get my last Sunday green letter before Wednesday. You would get it on Thursday I guess rightly eh? How queer that you should be thinking of the same subject as I have been thinking about this last week & today even. No I have not a stripe yet, I still class as a ‘Tommy’. The Soldier’s Friend. 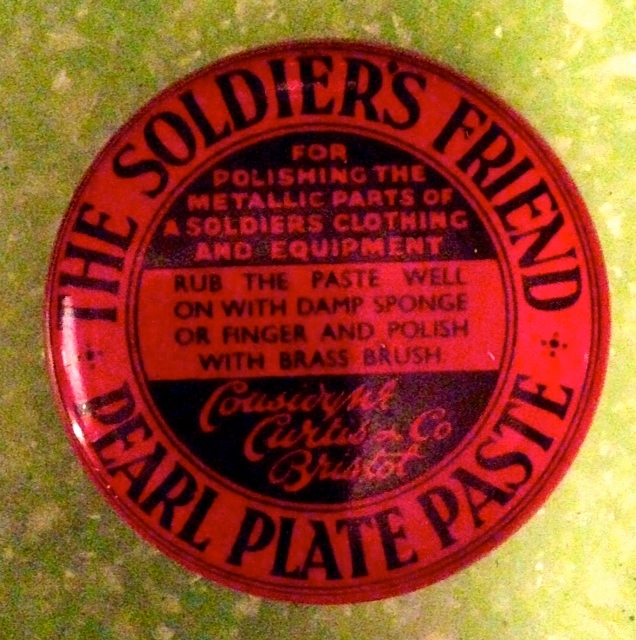 Pearl Plate Paste. You need not send me any money thank you very much Mummy. I should only spend it on things which you could send me in parcels, for instance I want some ‘Soldier’s Friend’ a kind of ‘Perka’ (sic) (11), only in tins, for brightening my buttons. I will close now with my Best Love to all. B.
PS I saw Ball* yesterday morning since his return from Leave. 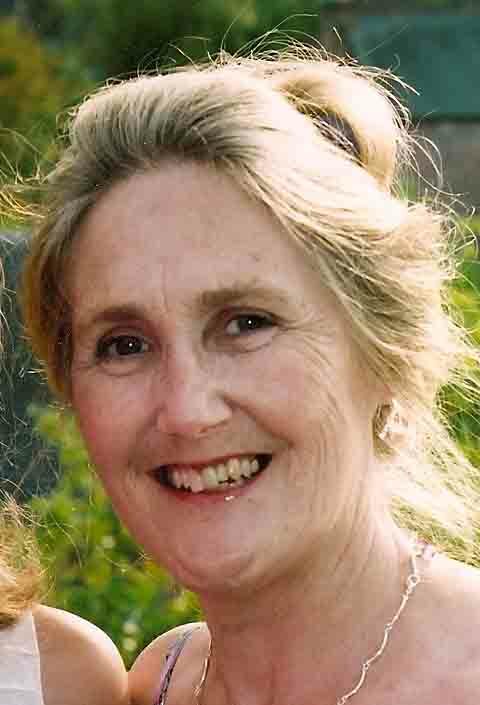 He told me he met a ‘Lady’ in Lichfield & that he went into Father’s Office (12). I offered him a few chocolates at tea time. I guess your ear would burn at tea time for I guess we were, both sides of the water, enjoying a nice Sunday’s tea. God bless you all. Bertie. Both Serjeant Sydney & Bertie Hibbett, still a ‘Tommy’, had yet to hear about their application for Commission in 1/5th & 3/5th South Staffords, respectively. It appears the ‘new draft of officers’ displayed ‘swank and ‘offishness‘ – a proud lot, not to be compared with those who came out with the Staffords in 1914. From this letter we learn that my father was worried his Mother might think his ‘Sniper Atkins’ ‘vulgar’. 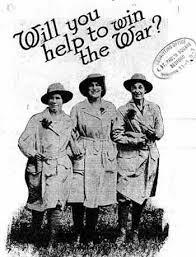 Also that Ida’s new voluntary work was in the Women’s Land Army, a decision she had kept from her Mother. 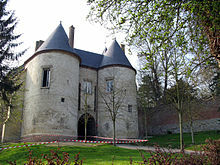 (1) Lucheux: medieval village, approx.13 miles from the Front. Place for rest & training – with a 48th Field Ambulance (37th Division) Hospital. Here the 137th (Staffordshire) & 138th (Lincoln & Leicester) Brigades (46th Division) created a large scale model of German Lines at Gommecourt for Battle Practice. 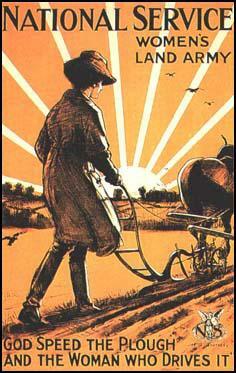 French farmers called the 46th Division ‘Les autres Bosches’ for taking up valuable arable land. 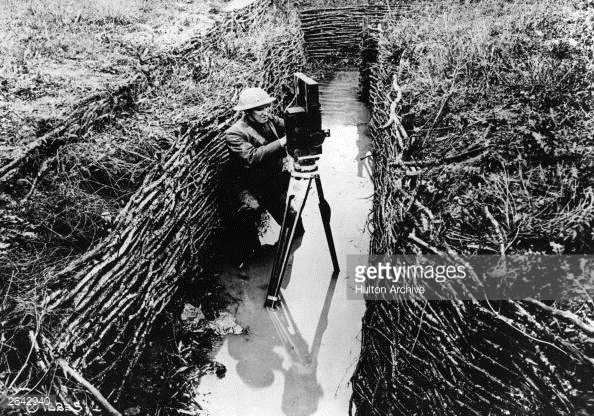 Lucheux Woods were exploited for cutting sapplings for hurdles & ‘revetments‘ (trench supports). 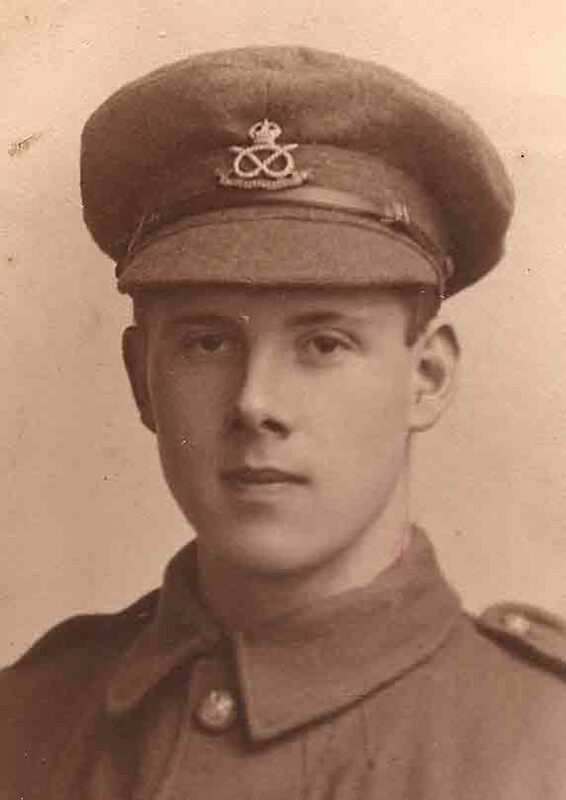 See Gerald Gliddon: Somme 1916 A Battlefield Companion. 2012. (2) Psalms for 28th Day, Evening Prayer (Book of Common Prayer) are again applied by Pte Bertie to comfort his family & make sense of his life. (3) I am not alone/ the Father loveth you: Gospel of John, 16.32. (5) ‘Pathesons’: Walsall Bakery? Bates* could be Bertie Hibbett’s former supervisor in Mining Surveyor’s Office, Lichfield Street, Walsall. (6) Fragments of France: Captain Bruce Bairnsfather. Published in The Bystander. 1916.<http://brucebairnsfather.org.uk&gt; & Hibbett Letter: 17th May 1916. (7) ‘Samudas: familiar name in Walsall/ Birmingham area. No direct reference found. (8) Armoury Course: oldest trade in British Army /maintenance & repair of small arms & weapons systems. Details outlined in ‘Instructions for Armourers’, 1897. <http://www.rifleman.org.uk/instructions&gt;. (9) Military Sunday: national Fund Raising Day for Soldiers? (10) Tame Valley: South of Tamworth on Staffordshire/Warwickshire border. Firing Range for Army/ O.T.C. Queen Mary’s School Walsall. (11) ‘Perka‘ text unclear/ could be ‘Perika‘/ brand name for cleaning polish? 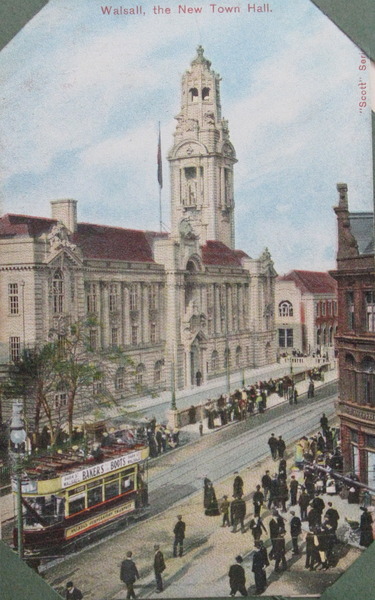 Post Card: New Town Hall, Walsall 1905. (12) Town Hall, Walsall.1905. Arthur Hibbett’s Education Office was at the back of the building to the left I think. NEXT POST: 1st June, 1916. Bairnsfather.Birthday Food Parcels 1916.Course of Armoury 1916.Education Office Walsall Town Hall.Empire Day 1916.Fragments of France.Green Envelope 1916.Hurdles.Lucheux Belfry Tower.Malvern.Military Sunday.New Draft of Officers 1916.Patheson's Walsall 1916.Perka.Psalms.Rat Catchers.Rats.Soldier's Friend Polish 1916.Walsall Tame Valley Range.Women's Land Army.